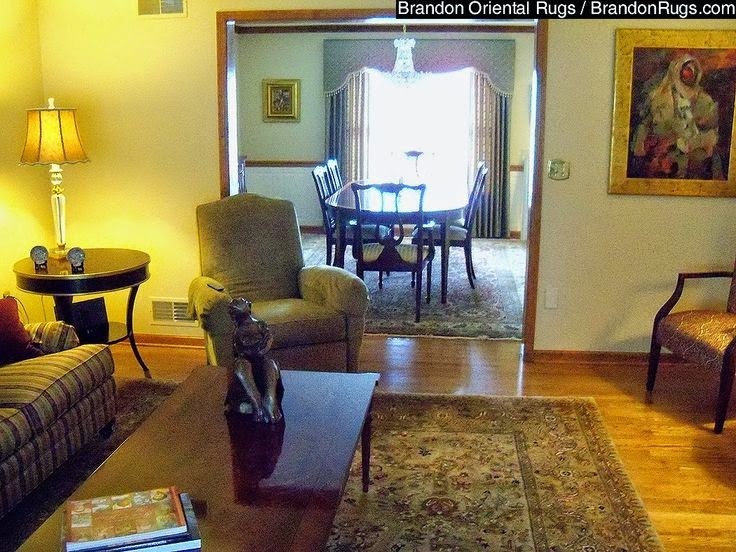 Think you can't use patterned rugs when there is a lot of other pattern in the room? Check this out, and think again. From the beautiful Persian rug on the floor to the incredible wallpapers by Bradbury & Bradbury, it's almost more pattern than can be imagined in a limited space; and it's close to perfect. If this much accomplishes so much, you need not fear doing too much by doing less. 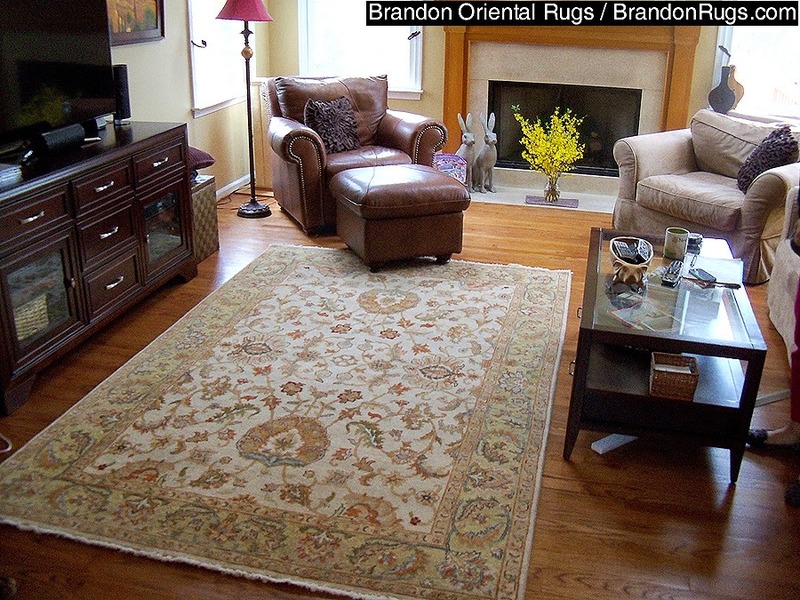 REAL handmade oriental rugs have long had the distinction of being perceived as "Art for the Floor". Now, many of us are beginning to see and appreciate that, as an art form, fine quality rugs have been trodden underfoot for too long; and deserve a fair chance at being elevated to prominent display on the wall as alternatives to paintings, prints, and photographs of merit. Hand-knotted India Agra design rug selected from Brandon Oriental Rugs (BrandonRugs.com) by a Doylestown, PA interior designer for the family room of her client, a well-known artist. ALBANY — When looking for a fresh new look for a room in your home, Atlanta interior design expert Jennifer Boles says the best approach is a classic one. Boles, who has a strong following for her 8-year-old blog Peak of Chic, believes in mixing classic elements into modern decor. A contributing editor for House Beautiful magazine, the decorative style blogger and lecturer says there’s a reason why truly classic designs and styles are timeless. “If you look back over the centuries, there have always been wonderful examples of classic design,” she said in a recent interview, “and classic design, no matter if it was created 300 years ago or 1,000 years ago, remains classic throughout the centuries. Last October, she added author to her resume with the release of her book, “In with the Old: Classic Décor from A to Z.” She’ll be in Albany noon-3 p.m. on Sept. 24 to sign copies of her book at Place on the Pointe, 2416 Westgate Drive. Place on the Pointe is accepting pre-orders of the book. “In with the Old” focuses on 100 classic design components, but doesn’t stop there. It gets into why an element is classic and, just as importantly, how it can be used now. “You can tell somebody this is classic,” Boles said, “but you need to go one step further. You need to explain what makes this piece of furniture or this fabric classic. What is it about it that makes it timeless, and how do I use it today? That’s what I tried to do with my book. Asked if homeowners these days are simply reluctant to take design chances, Bole said, “I think there are people who really want to, but they’re not really sure how to take that piece of furniture they inherited from their grandmother or their great-aunt and incorporate it into their homes in a way that looks 21st century. It’s not as hard as one might imagine. An antique chair, she said, can be paired with a modern table. An antique chest can have a contemporary black-and-white photograph placed above it. That individuality of design has been a hallmark of the South, she said. “It used to be, especially here in the South, we always had our Southern eccentrics,” she said, “people who just lived their own life. Their homes were different, they were a little different and the way they behaved was a little different. We accepted them. And an apparent modern-day phobia regarding brown wood is something she’d like to see overcome. “I think for some reason people are not so crazy about brown wood. I understand perhaps not wanting to have a lot of brown wood in one room, but taking some of these inherited pieces — the great old brown wooden tables or sideboards — and incorporating those in interiors today” is something she’d like to see, along with a renewed appreciation for antiques. While antiques have maintained a larger degree of popularity in the South and New England than other regions of the United States, they’re not as popular as they used to be. For the homeowner who wants a fresh look but doesn’t have a lot of confidence and isn’t sure where to start, the easiest low-risk change to make is with a paint brush. And one doesn’t have to be a color expert. “There’s really no wrong color,” she said. “It’s a matter of how you use it. In one home, a dark eggplant color might be the right thing for a dining room, but in another, maybe it’s too dark or the architecture doesn’t work with it. Those who want to go for bigger changes need to educate themselves on styles and, most importantly, decide what their taste is. “If somebody is really interested in developing their own look and style, then the best way to do that is by getting out and looking,” Boles said. “Train your eye. The way you do that is by going to antique stores, retail shops, seeing what’s out here, learning what you like and what you don’t like, going to museums or traveling. The process also builds self confidence, she said. Boles own journey took her from working at her father’s business for 10 years to a career in interior design. What started out as an avid interest evolved into a profession. “My background was business,” she said. “I always enjoyed interior design and what I was especially interested in was the history of interior design and the decorative arts. It’s something she’s always appreciated. Boles grew up in an Atlanta home, built in the 1920s, that had early American antique pieces. She became interested in old houses and antiques, majoring in Modern European history in college. Some 10-15 years ago, her interest in design — particularly, the history of design — led her to start researching the subject, initially just for fun. Then in 2006, she decided to take a stab at a relatively new social medium — a web log. “I thought it’d be interesting to start a blog,” she said. “It didn’t cost any money and it was easy to start. After about a year, her PeakofChic.com blog got her noticed by House Beautiful, for which she became a contributing editor. She also lectures on interior design and has been promoting her book. Now, she’s hoping her book will open doors for others who need some inspiration to give their homes more personality. “I think they (readers) are going to learn about pretty much all of the classic design elements from throughout history,” she said. “They’re going to learn how fashion designer Bill Blass or decorator Dorothy Draper used these elements in their projects. Boles noted that it had been years since she last was in Albany, adding she was “looking forward” to her appearance at Place on the Pointe. And she thinks she lives in the perfect part of the United States when it comes to pursuing her career interests. Thinking Big: The Experts Weigh In: What Makes Something Well Designed? Is Your Interior Design Depressing You? "It's unclear who is really protected by extensive licensing requirements for interior designers, because professionals and consumers both suffer when governments adopt hefty barriers to entry." Homeowners hire interior designers to beautify their living space. It's an industry focused on style, design and aesthetics. So, given the innocuous nature of the profession, it seems absurd that 26 states, plus the District of Columbia and Puerto Rico, require prospective interior designers to spend two or more years meeting the education and experience requirements necessary to receive a government-issued license to work, according to information from the American Society of Interior Designers. Despite the hefty requirements these states place upon would-be professionals, the median annual income for interior designers in 2012 was just $47,600. The median annual income for Americans with a bachelor's degree was $49,570. The median annual income for Americans with a graduate or professional degree, meaning those who study for more than four years of undergraduate work, was $65,528. So why do prospective practitioners of this trade have to jump through so many hoops? It's hard to imagine that interior designers -- who deal in cabinet design and room layout -- pose a serious safety risk to the public. Economists Jaret Treber and David E. Harrington of Kenyon College found that state governments that regulate interior design make it difficult for people to enter the profession and more expensive for consumers to purchase design services. Interior-design firms in regulated states earn significantly more than those in unregulated states - about7.2 million more in a city with a population of 1 million. In regulated states, the number of interior designers fell by an estimated 1,300 between 1990 and 2000, demonstrating that regulation is limiting economic opportunity in interior design. Black and Hispanic interior designers are nearly 30 percent less likely to have college degrees than white designers. Thus, regulations with academic requirements disproportionately shut minorities out of the field. Increasingly, going into business for yourself or embarking on a new career doesn't just require setting up shop and acquiring the necessary skills for success. It's about paying fees and meeting arbitrary government requirements. According to a 2007 Reason Foundation report, 20 percent of the workforce needed to obtain a license to work as of 2007. In the 1950s, that number stood at about 4.5 percent. And since licenses are usually difficult and expensive to obtain, professionals already working in a given field feel less pressure from new competition. And often, the rules for each profession don't match up with the level of safety required to perform the job well. While 26 states require prospective interior designers to have a total of two or more years of education and experience to get a license, the national average for emergency medical technicians is just 33 days, according to the nonpartisan Institute for Justice. From time to time, someone will corner me and confess to me that they are depressed; they whisper that they believe their decorating is making them sick. They tell me that their interiors are not to their liking because of choices made by their spouse, their designer, or because of their own misguided attempts at decorating. Is it possible for their environment to make them feel sick? Yes (as I think about it), it is possible for design to alter moods. In the mid-1950s, Norbett Mintz, a researcher at Brandeis University, and his mentor, the renowned psychologist Abraham Maslow, decided to conduct research about the effects of "beauty" on behavior. Mintz had already conducted experiments about the effects of color on human behavior and concluded that color selection has a palpable effect on personal behavior. overstuffed room can affect your ability to relax and feel comfortable. In their experiment about beauty, they designed three rooms. The first was "the ugly room", replete with clashing colors and patterns, disorganization and too much furniture for the size of the space. The second was "the average room", arranged with a monochromatic scheme, basic furniture pieces and subtly colored nondescript art. The third was "the beautiful room", decorated with quality case-goods, and fashionable fabrics and colors. Overwhelmingly, the test group rejected "the ugly room". "The average room" and "the beautiful room" were tied as the preferred room. When asked to describe the rooms, the test group was best able to describe "the beautiful room". As a designer, this is not news to me. There are rooms, especially those that I like, that I can describe with remarkable detail. Although our notion of what is beautiful varies from person to person, it can be said that beautiful design is more memorable. We can deduce that each person prefers the beautiful. From the time we are born, there are foods that are preferred -- some love sweets; others prefer more savory flavors. Over time, our taste buds evolve, and what was once a favorite food can become insipid or nauseating. The same is true for interior design. Over time, everyone develops preferences about what makes us feel comfortable and at home. When I hear that someone's home is depressing, I am concerned. I suggest immediate action to change what is most bothersome. If it is wall color: a painting party is overdue. If it is furniture: I ask them to consider new upholstery; a new furniture arrangement; or substituting new pieces for those that offend. And for those too timid or dismayed to tackle their problems head-on and alone, I suggest hiring a professional interior designer. Our customers purchased new living room and dining room furniture from Hendrixson's Fine Furnishings in Shimersville, PA.
With most of both rooms finished, they asked Brandon Oriental Rugs to help them find two fine quality oriental rugs that would coordinate with each other, and serve as the last puzzle pieces to complete their decorating. 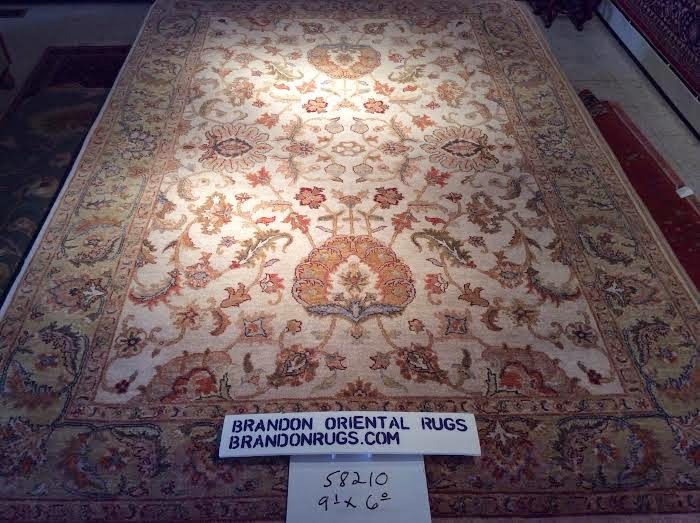 Both rugs are finely detailed, hand-knotted, antique reproduction Persian Tabriz design oriental rugs made in India. The living room rug has a golden-maize color background with an antique gold border that subtly complements the fabrics and floor color in the room. 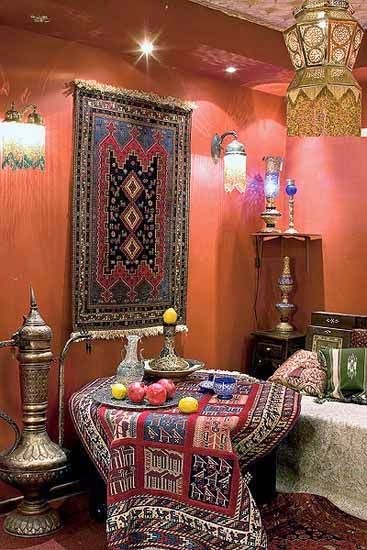 The small scale motifs add color and interest while not defeating the supporting role the rug plays in the room to the customer's collection of fine original artworks. 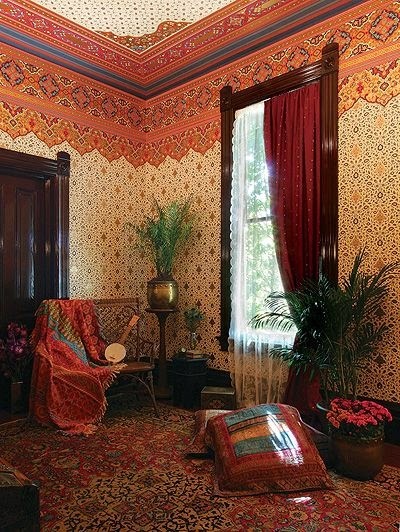 The dining room rug is an unusual "Hasht-guli" design with berry-red background and golden-maize border that complements the living room rug, the rich mahogany wood-tones of the dining room suite, and the fabrics used in the custom window treatments designed and installed by Hendrixson's. The wonderful result wrought by our customers expressing their good taste in an unswerving commitment to quality is proof that a modestly sized home can look and feel as elegant and luxurious as any palace. 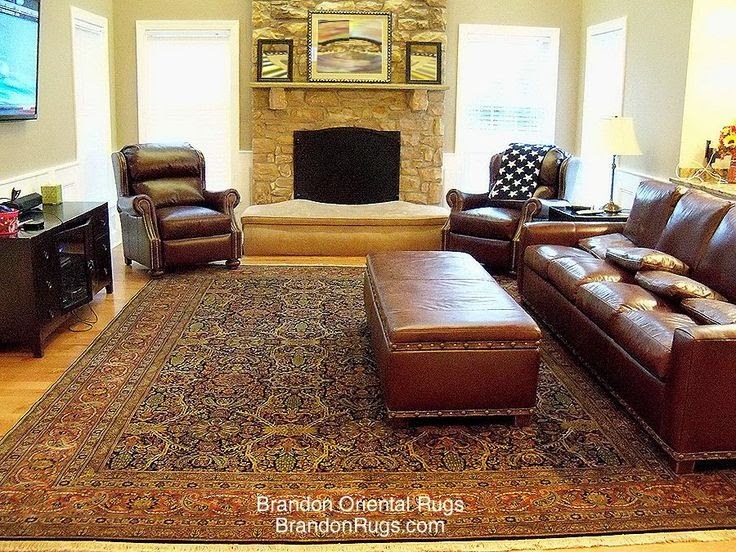 Oriental Rugs: What More Can You Say?